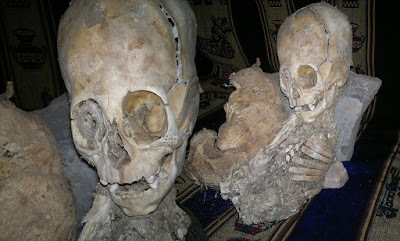 Ghost Hunting Theories: Giant and Unusual Skulls From Around the World! 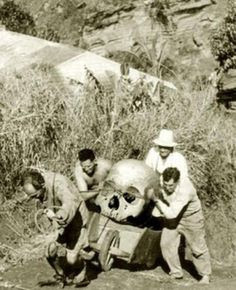 Giant and Unusual Skulls From Around the World! As amusing as these oversized skulls shown online might be, there is something we can learn from actual giant skulls that have been found around the world. The human skull shows the origins and lineage of a race of people. 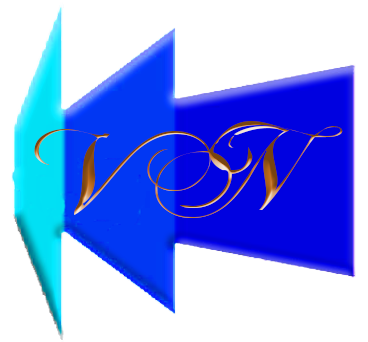 We have been able to distinguish some races of Native People in the Americas as being separate origins; such as, the vast majority of Native Americans of Asian descent and some of the coastal Indians, such as Karankawa of Texas, being related more to the aborigines of Australia. The skull shapes are the distinguishing factors. You can hide many things in skin color and features, but skulls take us back, sometimes very close to the archaic features of our ancestors. 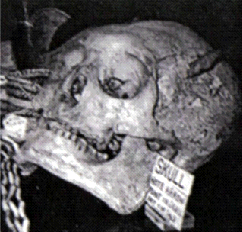 The giant skulls dug up around the world definitely show more archaic features quite blatantly. 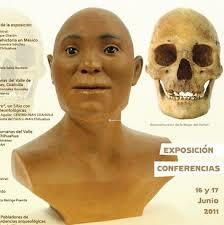 They can also reveal common ancestors with people here today. 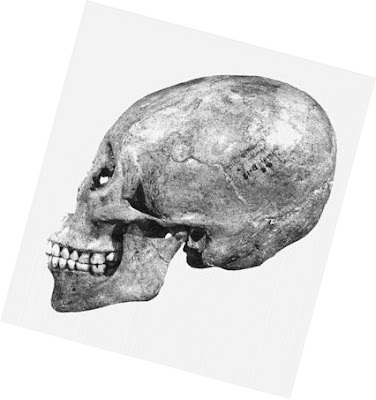 One skull type categorized by anthropologists is "otamid," one that is referred to as archaic, with an elongated shape to the back of the head, strong square jaw, sloping forehead and pronounced brow, among other "robust" features. 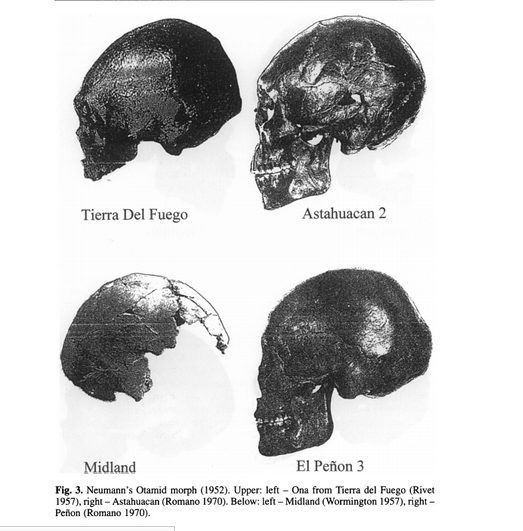 Some Indian people of the Americas showed these traits; Tierra del Fuego (Yaghan at the tip of Argentina), Astahuacan (Mexico), Midland (Texas), El Penon (Mexico) and Karankawa (Texas Coastline) are just some of the otamid skull shapes that reveal a lineage more in line with another region than the Asian skulls of the Native American people. 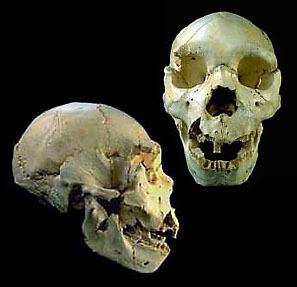 Can you see the larger skull size on the right; the pronounced brow, sloping forehead, elongated back of the head, deep powerful jaw of the Neanderthal compared to the Homo sapiens on the left? The aboriginal people of Australia have a different skull shape than Europeans, and they also possess Denisovans DNA, as well as Neanderthal. 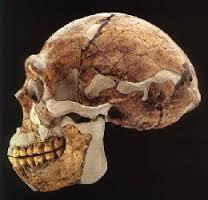 Europeans do not have Denisovans DNA, but do have Neanderthal DNA, yet do not have the skull shape as above. 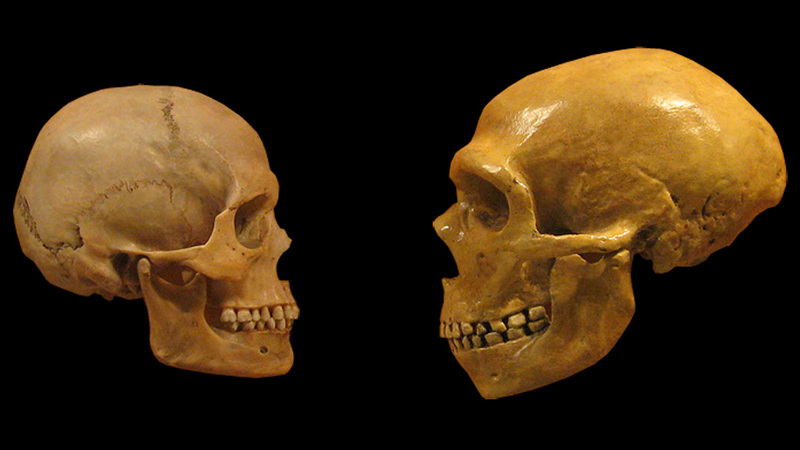 So, we can assume Denisovans too had a similar skull shape to Neanderthals and Homo erectus, likely giving it a very dominant feature to a people who possessed both DNA. 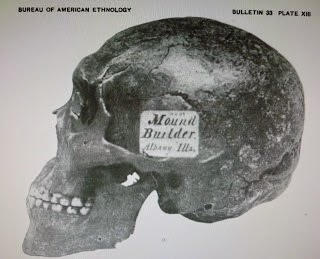 Some aboriginal/polynesian skulls ended up in the Americas long before the Amerindians arrived from Asia, making them the first people to populate the continent, at least 13,000 years ago and likely more like 25,000 years ago. 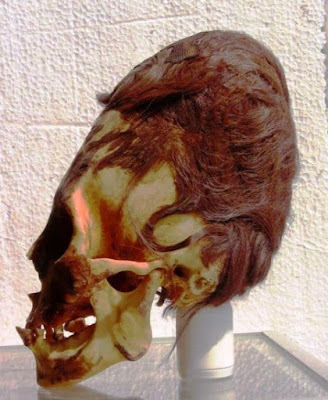 In Mexico, a skull was found that dated back over 13,000 years of a woman who was not of Northern Asian descent, and she was dubbed "Penon Woman." Source: A population of the long-headed individuals being studied by Dr Gonzalez had survived into historic times, she claimed. This tribe, which lived on the Baja California peninsula, were called the Pericues. 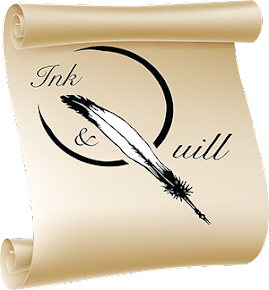 But they appear to have died out in the 18th Century because of disease. Spanish missionaries reported that they were of a different racial type and had different customs to other Native Americans. We might need to rethink where Neanderthal and Denisovans (as well as other forms of man) went and how long they were around breeding among us and leaving their influences. 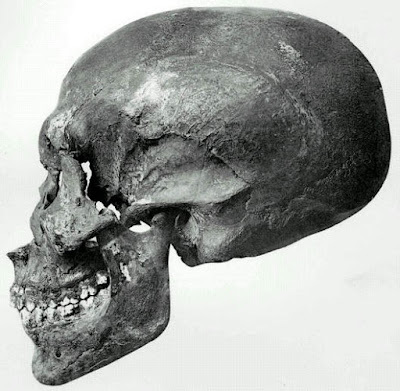 So, we are positive there were definitely ancient people in the Americas who had "different" shaped heads than those we come to call Native Americans. 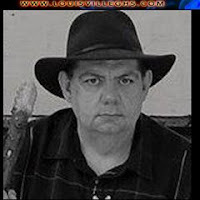 One of these such people were the Karankawa Indians of Coastal Texas. Early explorers told of these people's prowess with a tall bow and arrow, their elongated ears with spools in them (like the long-earred's in Easter Island and many Polynesians, living along the sea). They also said this tribe was unusually tall. 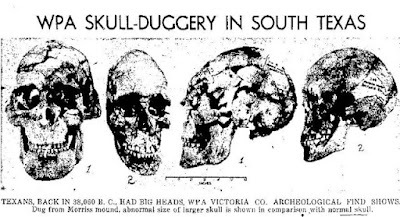 In the Southwest, one find was described as having a skull so big that the discoverer could pull it over his head like a bucket. 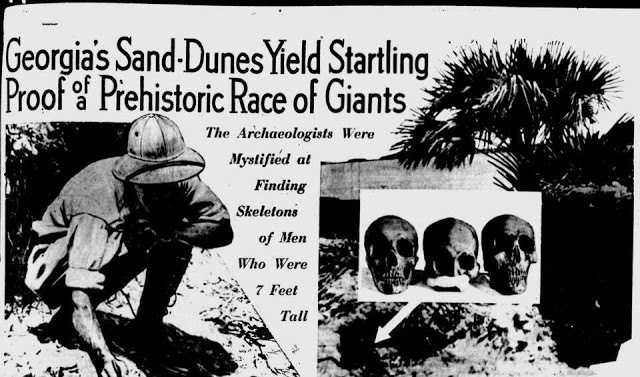 The ones in the mounds area of the Ohio Valley were described as having sloping foreheads and pointed heads. In finds from Tennessee hundreds of years ago, they were described as looking like cave men, with sloped skulls and pointed backs to the heads. The Texas mound skull from Morris Mound (above) shows #1 the skull found from front and side and #2 a regular present day person's skull. 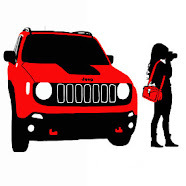 Some refer to the elongated back of the head as a bun and it is created by interparietal bones called "os inca" bones. 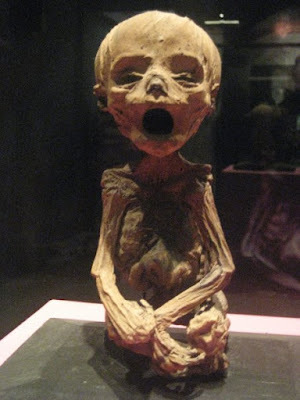 These have been found happening naturally in some Native people around the world, but some cultures tried to imitate it in their babies with head wrapping and board wrapping, including Polynesians, Africans, Northwest Indians and more. 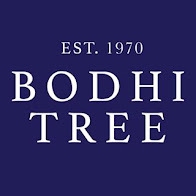 This shows an influence around the world, perhaps an influence of the people who had settled the entire Earth before Homo sapiens left Africa and scattered to the four corners of the earth. 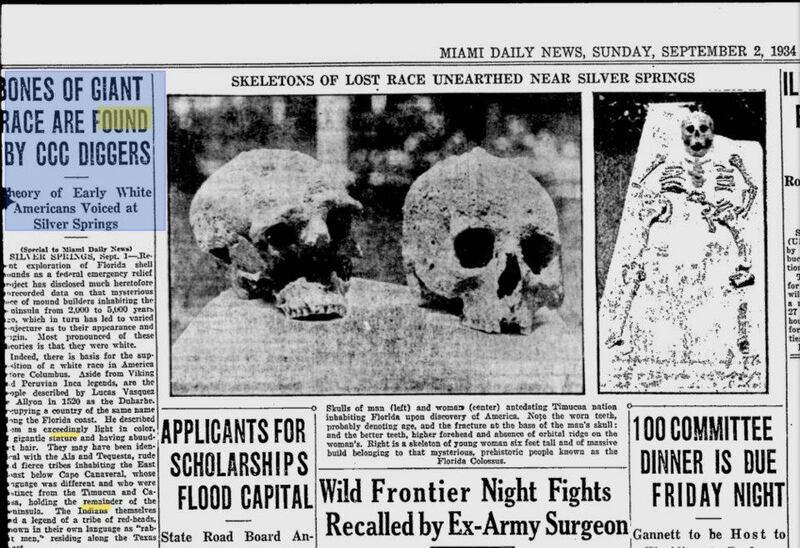 Above is an article about a Florida find of "lost race" unearthed there. Georgia mounds, which have shown an influence almost directly from Mexico/Central American tribes of long ago, shows that there was a common influence among architecture, farming, and irrigation that an be seen as far away as Arizona where the HoHoKam were utilizing advanced astronomy and irrigation systems. 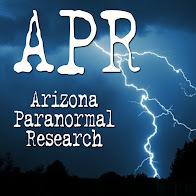 And, by the way, Arizona had many ancient giant finds which is not surprising, as the state is a major copper producer and giants and mining metals go hand-in-hand. 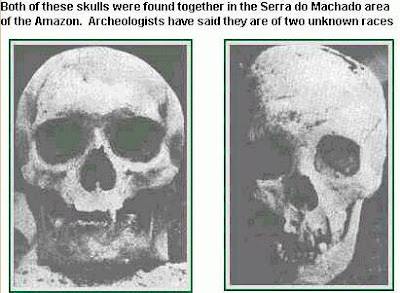 These two skulls above were found in the Amazon region and both supposedly unidentified races. 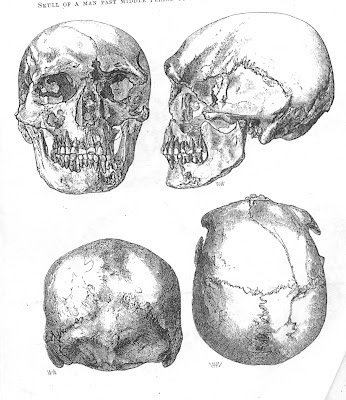 The one on the right appears to be much like the Penon woman who was thought to be Caucasian, but the fellow on the left has all the earmarks of a giant; pronounced brow, very square powerful jaw, sloped forehead, the nasal hole is between the eyes instead of at the bottom of the eyes showing likely a nose that was attached in the forehead area instead of between the eyes as ours are. Interestingly art from that region portrayed a race of people with this high riding nose that seemed strangely out of place. 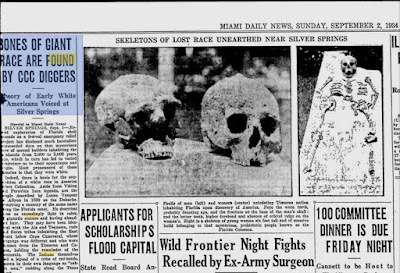 There are some of these elongated unusual skulls found around the world, like these two from Green Gate Burial Mound in Michigan and Stonehenge - that look very similar. 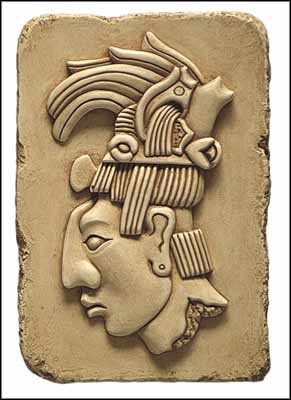 There were "another" people among us in regions where we don't see that head shape in the "Native" people. This leads me to believe that what we consider native on the earth was an earlier race of people who lived around the earth, perhaps bred with us arriving Homo sapiens who were late to the game. In 1925, in a mound in Indiana, they found the remains of some folks who certainly did not look quite right. Does this skull shape look familiar? 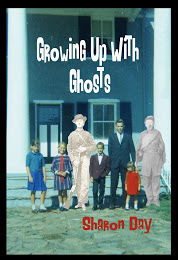 There were 8 skeletons in a spoke-like fashion, and a gigantic one among them. 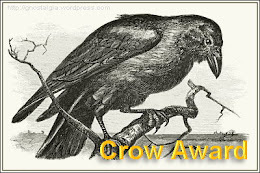 In the usual mound-like fashion, copper, precious metals, obsidian, and shells were found in there. 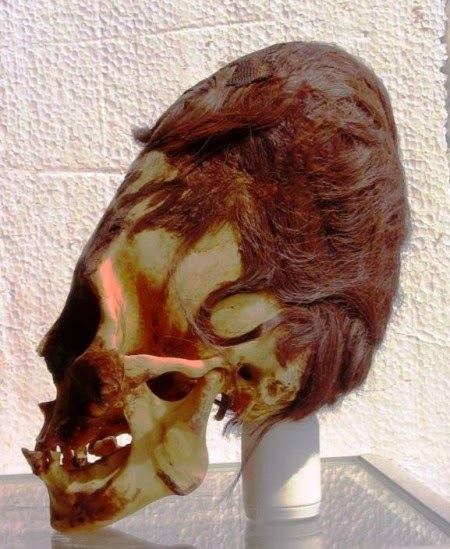 Although some have claimed to test the DNA from the Paracas elongated skulls and found it to not match anything on earth, until that is verified by proper sources, I consider it conjecture at this point. DNA aside, we have an example in this mummy of a skull that is elongated in a youth. 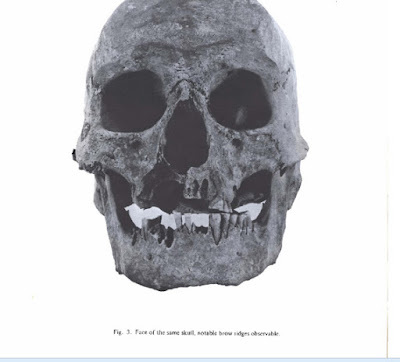 What is interesting to me is not that the skull might have been elongated by forced means, but looking at the eye sockets and nose hole compared to a regular mummy of similar age (below) the orbits are not even similar! And the jaw is much more developed! 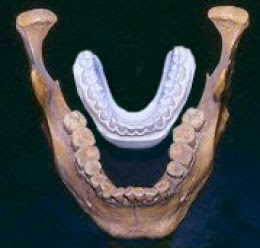 The jaws of the ancient giants are specifically interesting for the power, the prominence, and sometimes even reported double rows of teeth which might be the result of crowding in a jaw that has influence of a hybrid Homo sapiens that is not adequate to handle the huge teeth (such as found in Denisovans). 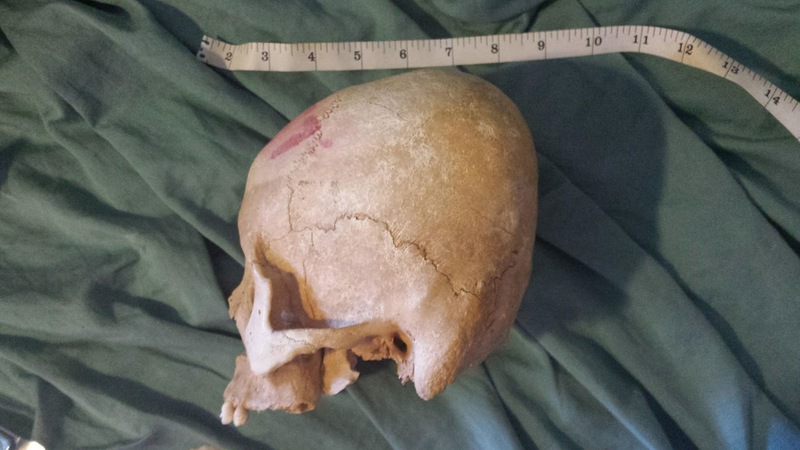 What can skulls tell us? 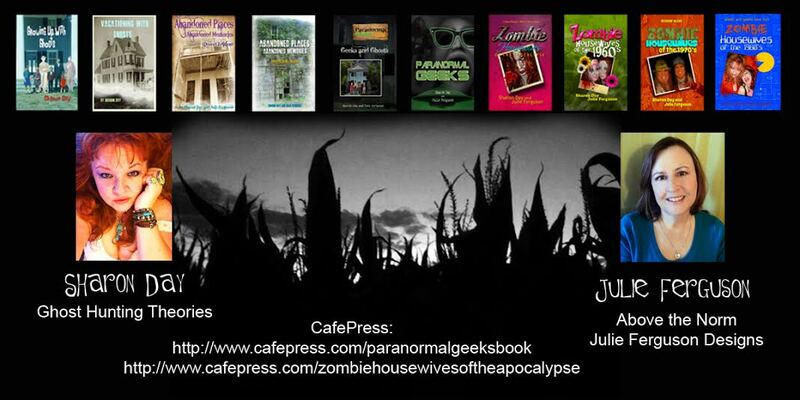 Well, man is all related, but adapted as he moved on to other locations. 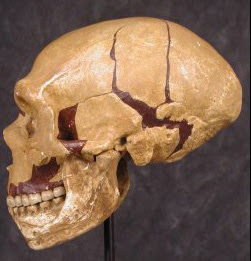 We all come from Homo erectus, but some bore interesting variations from the isolated "hobbits" of Indonesia to the giant population worldwide, from Neanderthal, Denisovans and other man still being discovered recently like this jaw off the shores of Taiwan . 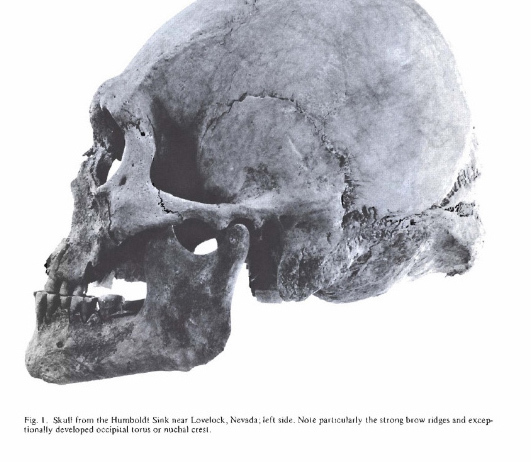 What can we learn from the giant skulls by their origins? Well, Homo erectus in their distance past, but perhaps Denisovans are our suspect in the tens of thousands of years time frame. 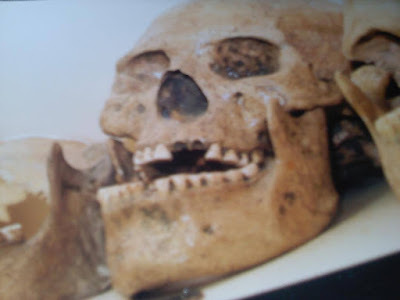 We have yet to find a full skull, but we know they had sizable teeth, that today where Denisovans DNA shows up, there are "Bigfoot" type variants of man upon the earth. So, one can assume that Denisovans might have been tall, hairy, and powerful. 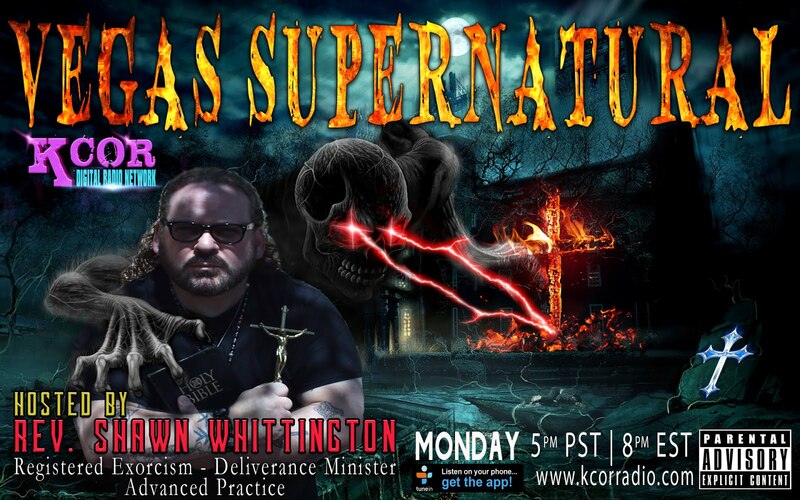 Why are today's people with Denisovan DNA not like that? Well, we have had tens of thousands of years of breeding among purely Homo sapiens population, so the percentage of traits from them are small, under 4%. And we know that Europeans might have coloring or body builds like Neanderthal upon occasion, even the Solomon Islands are known to produce odd blond and red haired offspring, likely from the Neanderthal influence long ago. But what did Denisovans give us? We have much to learn about that yet. We do know they gave a gene to handle high altitudes to the Sherpa of the Himalayas. 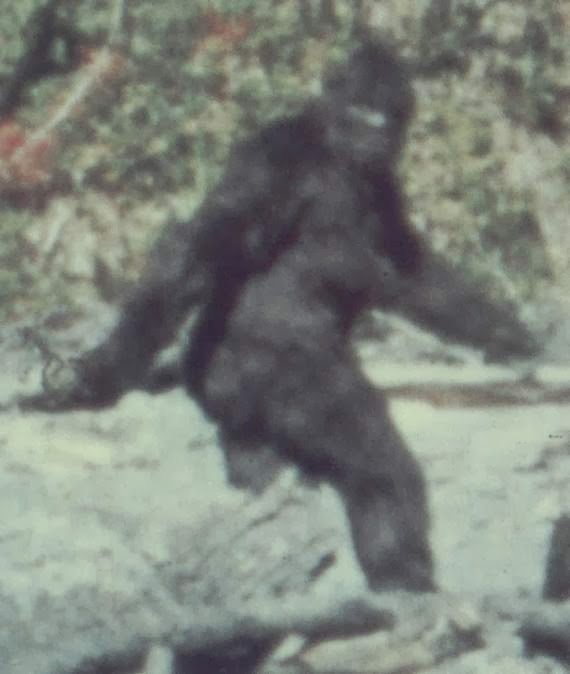 There are also reported "yeti" in that region. 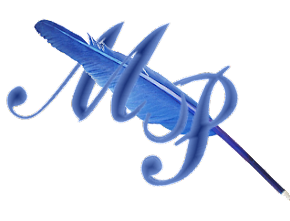 Siberia (where Denisovan teeth and bone were found) report the "Alma." 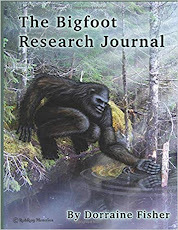 The aborigines report "Yowie." 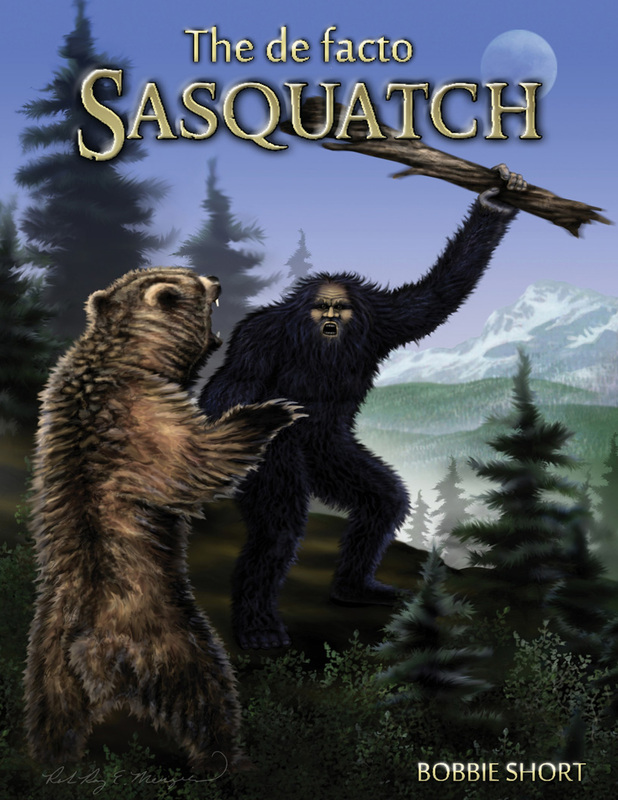 The Americas with coastal indians with otamid head shapes report "Bigfoot."